“in some cases to have the fun of taking a hand in developing [wonders], and also in being able to help other people..” and the GPL clause stating that “For example, if you distribute copies of such a program, whether gratis or for a fee, you must give the recipients all the rights that you have”. Since 2004, however, I have seen very, very little concrete activity in this sense. Even very recent, potentially promising initiatives like these new badges for UK scouts don’t make any explicit mention, or promotion, of Free Software and Open Digital Standards. I’ve even met cases of explicit preference and demand for proprietary software in scout associations. However, I’d like to have a more complete view of the current situation worldwide, in order to write a real follow-up to “Bit Prepared”. Is “Free as in Freedom” (*) Software actively used and promoted (or discouraged/made harder to use…) in your own Scout troop, or association? If yes, how? If not, why? Please let me know, in the comments or by email. 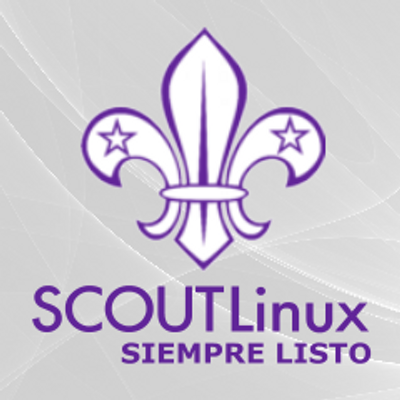 I have used as image for this post the logo of the ScoutLinux distribution only because it is the best image I’ve found to give an immediate, very general idea of what this post is about. At the moment, however, that project seems dead. If you have a better image, please let me know. Regardless of the actual status of ScoutLinux, I would like to make clear that what I am talking about is not Scouts creating even more Gnu/Linux distributions, specifically for scouts. I honestly fail to see what the real need for them would be, because a scout computer user has almost exactly the same computer needs than a non-scout computer user. I am talking about scouts using and/or contributing to, existing Free Software. That is what matters. (*) Free as in Freedom Software is NOT freeware. It is software developed according to these guidelines!